We're at it again! Come out an enjoy delicious food truck party at the Museum of Natural History parking lot with your community. We have add more trucks and vendors so there is more food available. This doesn't mean there won't be lines, spilt up with your friends and meet back at your blanket or chairs. $2 entry (bring a twoonie). 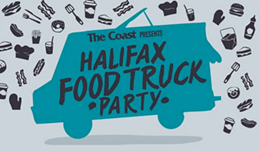 Your entrance fee also qualifies you to be entered into a random draw to win a Food Truck Party gift certificate bonanza! The Museum of Natural History will be open until 8pm by donation. It's a great chance to check out their amazing Wild Horses of Sable Island show. Hyper Cones "Hawaiian Shaved Ice"